Do Dental Implants Ever Need To Be Re-Done? Ask an Implant Dentist! If you asked 1,000 dentists which option they would choose for either themselves or a loved one with missing teeth, there’s a good chance that all 1,000 of them would say dental implants. Of course, each patient is different and some have particular needs or goals that might make a different option better. But, for the most part, implants are the preferred choice because they’re the next best thing to your own teeth! But does that mean that they’re successful 100% of the time? And if they do occasionally fail, what can be done to fix them? Keep reading to find out! You’ve probably heard that implants can last decades with basic care and maintenance, which is certainly true. But, unfortunately, no medical procedure is done successfully every single time, so there are circumstances in which implants need to be restored. The good news is that the success rate of dental implants is very high – 98% in non-smokers. But what happens in the remaining 2% of failures? 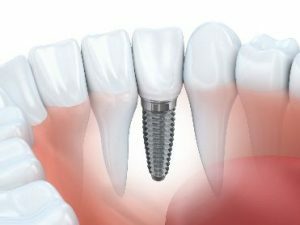 Short-term failure – In some cases, something goes wrong during the placement of the implant and it never quite “takes.” This could be because a patient’s jawbone isn’t healthy enough to fuse with the implant or because a practitioner doesn’t adequately prepare the site before placing it. Long-term failure – In these cases, an implant begins feeling loose or wobbly after a patient has had it for several years or more. This could happen because the bite has shifted, either from teeth moving over time or when a patient has had additional teeth extracted. Either situation can cause an implant to take additional or excessive chewing force and stop functioning properly. How Do You Fix a Failed Implant? Fortunately, an implant can be restored or replaced fairly easily. Having said that, the sooner the problem is detected, the better. If your implant doesn’t feel quite right or you suspect something is wrong, contact an implant dentist right away. Implants do an exceptional job restoring the function and appearance of the smile and are almost always successful. Rest assured that if you ever have any problems with an implant, it can be safely and reliably fixed to give you many years of great oral health! Dr. Jaclyn Jensen is a general and implant dentist who has seen firsthand how implants change her patient’s lives for the better. In addition to pursuing advanced training in implant dentistry, she also has many years of experience that allow her to consistently deliver outstanding results. If you have any questions, she can be reached via her website or at (218) 281-1301. Comments Off on Do Dental Implants Ever Need To Be Re-Done? Ask an Implant Dentist!